>Romeika, que final lindo o do seu texto. 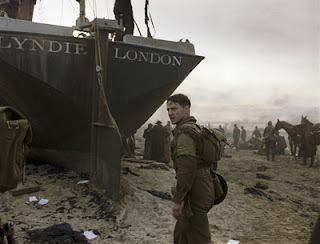 :-)Eu concordo com você: "Atonement" é um filme que fica conosco por muito tempo. Eu acho que a complexidade do livro de Ian McEwan foi transposta para a grande tela e o resultado é um filme pungente, que nos faz refletir sobre as escolhas que fazemos e que nos tornam as pessoas que somos. >Nice review – sums the film up very well. I wonder whether it'll get the Oscar tonight for best film? >I loved this movie.It took awhile for me to process beyond the obvious things (that I loved). I am convinced that Briony said what she did deliberately and completely out of spite because of what happened earlier that day by the river…of course I could be completely wrong…. >Assim como a Kamila, também gostei muito do final do texto. Sinceramente não podia esperar mais do filme (até por aparentemente ser um típico romance) e fiquei completamente envolvido com sua trama, especialmente nos maravilhosos primeiros minutos – além do desfecho revelador (não li o livro).Abraço! >For me, it was the best of the Oscar nominees, and the best movie I've seen in the movies since Brokeback Mountain. Its beautiful, gorgeous and it challenges the structure of cinema. It's a movie about love and erros and the power of words. And its about how we are constantly manipulated in believing happy endings, that, in reality, are so tragic. But sometimes…we need those happy endings. Loved every second. Editing, cinematography…everything rocks!Ciao! >I wish i could watch that show. But i was hoping to read the book before that XD The book always moves me more. >É Romeika, respeito sua opinião, mas não vou longe com esse filme, é um bom filme? Sim, mas não passa disso.ALém de que esse cineasta é pretencioso demais. Menos para ele traria uma enorme recompensa, e até quem sabe reconhecimento. >I didn't see the film. I saw and read the previews. It seemed too tragic to bear. I have a friend who saw it. She said it was very good but sad. >Oi Romeika!Gosto de ATONEMENT. Achei mais filme que ONDE OS FRACOS NÃO TÊM VEZ. Só tenho uma pequena ressalva na parte da guerra (só com o Robbie). Mas adoro o filme, vou comprar o DVD, quero ver os extras… Enfim, merecia bem mais o Oscar.Se bem que meu favorito era THERE WILL BE BLOOD.Bjs! >i'm glad you adored atonement! how you could not haha!? just kidding i do know of few who disliked it, i dunno where their head is at because it is a stunning film- impeccable acting (which you highlighted very well in this post- i haven't seen the film disseciton just by preformances before, good job! ), gorgeous score, beautiful costumes, astounding sets, and heartbreaking story. i actually cried during the final scnene on the bach, just what could've been- simply too much for me. one of my favorite books and favorite films! >I love your reviews and this one is awesome and intriguing. I've personally been avoiding this film for a long time as it felt from trailers and reviews that it was swaddled in bitter sentimentality more than anything, plus I can't stand Knightley… but reading the last few lines of your review makes me want to see it so much! must get the dvd.and your experience of the Audrey Hepburn curtains in the theatre is intriguing – actually at a local little cinema/theatre in a village by where I live they have two little screens and both are decorated with collages of golden age stars – waiting for a film to start in there, you see these faint shadows of Audrey and Humphrey and Ginger and others, and it is always a little magical and ghostly. >O filme é bom. Muito bom. Poderia ter sido mais lembrado no Oscar. Concordo que o filme fica na cabeça de quem o vê. Abraço!!! >Kamila, obrigada;-) E concordo com vc, Atonement gera reflexões, e ao contrário do que eu temia, não foi transporto para a tela somente como uma história de amor simplista. É o filme da Briony, assim como o livro é sobre a mesma.I wondered too, Nicole, but it didn't.. I haven't seen the The Coen Brothers' film, but many people say it was the film that less deserved the Oscar.Cindy, it could be a possibility. Briony is such an enigmatic character, there's a lot to read through her skin.Vinícius, valeu, e mais um fã de "Atonement" hehe:-) Abs!Wally, I have seen only two of all the films nominated to best picture (the other one was "Michael Clayton"), so I don't have an opinion on it yet. But I agree with you on your interpretation (the power of words) and yes, the editing and cinematography are brilliant (especially during the Dunkirk beach scene).Debbie, both the film and the book moved me, but in very different ways:-) There's a part of the book that didn't take place in the film, something that happens in the very end, and it was really moving reading it.Cassiano, tb respeito a sua opinião (viva a diversidade hehe), ainda assim discordo de que o diretor seja pretencioso, fiquei muito feliz com a adaptação do livro, que é um dos melhores que já li. >Seraphine, You should see it!Otávio, tb quero o dvd, e gostei das partes de guerra, que são a única ressalva que faço com relação ao livro. Nesse aspecto, gostei mais do filme do que do livro. Beijos.Jayne, as soon as Vanessa Redgrave appeared, it was hard not to cry. What an unforgettable moment it was, in such a short time. And all those images of Robbie and Cecilia, the facts and the fiction.. I agree with you on everything else, such a pity it didn't win best costume and best adapted screenplay (though I haven't seen the Coen brothers' film.) Luckily the gorgeous/intelligent/precise score was awarded.Headmistress, thank you! And so glad you like my writing on movies;-) I feared I would dislike Atonement for the very same reason. After a while I had no longer expectations and went to see the film when it was out anyway. And luckily it fulfilled all my previous expectations in the end, despite some very small "failures". Loved your description of the cinema theater in your village. Theaters like that truly makes the experience of seeing a film more special.Pedro Henrique, pois é, uma pena, só levou uma estatueta… :-S Abraço.João, dê uma chance a Atonement. E se estiver em cartaz na sua cidade, te aconselho a vê-lo no cinema. Abs.A.R, I couldn't disagree more. I saw the film exactly like I read the book, with very few changes that didn't alter in anything the novel's spirit. At least we agree that Romola Garai, Saoirse Ronan, (what about Vanessa Redgrave? :-), were terrific as Briony. >I haven't seen this film yet…I still really want to see it. I love James MacAvoy and Keira Knightley, so I'm excited to see them together. >Great movie. I completely adore this movie. And I will give dear Mr. McEwan's novel another go. 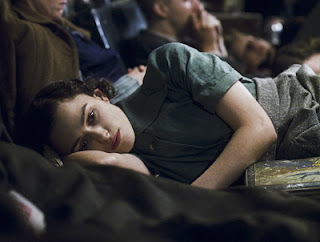 >I liked Atonement as a novel, but as far as Ian McEwan's work goes, I much prefer Enduring Love (though the film adaptation was somewhat blah). I haven't been able to fault any of James McAvoy's or Romola Garai's performances, and as for Keira Knightley, there might be something there beyond a pouty mouth and a pretty face. >I was actually pretty taken aback (in a good way) by the three actresses who played Briony- Saiorse Ronan, in particular, was brilliant. And so was James McAvoy, I'd loved him in Starter for Ten, but he was amazing as Robbie. >i thought the film was so stunning visually but it was missing somethingcome join the bloggers fashion forumbloggerettes.proboards91.comhope you join! >Hi Meg, I haven't read any McEwan's novel but "Atonement", but I'd love to read more of him sometime.The Clothes Horse, loved your interpretation of Briony through those symbols! 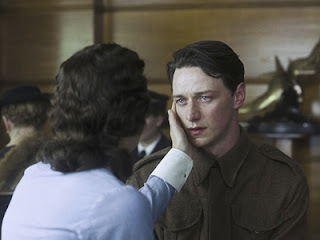 And I liked "Atonement" much more than "Pride and Prejudice" heheAisha, it's not a typical happy ending "melodrama" hehe You'll see.Modern Marie, the book is just wonderful.Blue Floppy Hat, in "Atonement" McAvoy gave the best acting I've seen of him so far. >Ainda não pude ver o filme, mas depois de ler esse post eu fiquei ainda mais curiosa! >I couldn't see the film. But I'm still considering it a wonderful novel..and I love it with all my heart. >Olimpia, I love it too! Hope you get to see the film sometime.